The stars must have been aligned, we finally had our first self-guided kayak-camping trip :-) In reality, it's the scorching heat/humidity that drove us out of the city into the relative wilderness of Gatineau Park. 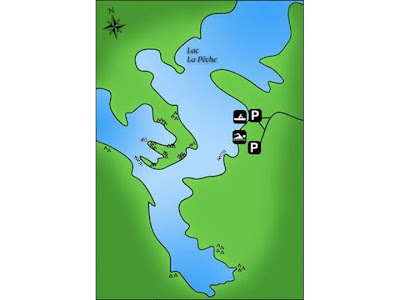 We camped for two nights at site #6 at Lac la Peche (see 4th Kayak Outing for map & details). It has a gently sloping rock at the edge of the lake that makes it easy to get in/out of a kayak. You can swim there until the edge of the rock where it meets the weed infested sandy bottom. Getting out of the lake is a bit of a challenge as the rocks are extremely slippery under water, probably from a thin coating of algae. Our solution was to tie a rope to a nearby tree and to let the rope float in the water for use as an aid to get out of the lake. Speaking of weeds, most of the lake is pretty well surrounded, at least where we checked. That's a bit surprising given that there are no cottages on the lake, very few boats, no obvious farming nearby nor any other obvious source of pollution nearby. We did find two good rocks where we could jump in & out (deep water) without getting near any weeds. The picture below shows campsite #6 (actually has 4 camping spots & a nearby outhouse) and the two swim spots we found. From there we were able to relax & enjoy a refreshing swim. Click on picture to see full size details. We checked out the most western bay where it's obvious a tornado passed by, uprooting at least a hundred trees, most near the abandoned cabins of Le Haven. You can see many broken & uprooted trees at the point of land North-West of campsite #6. The sunsets were great on both nights, real fireballs! There were severe thunderstorms that passed North-West of the park, we easily saw 1000 lightning flashes but we barely got a drop of rain. We could have used some cooling off as the temperature in the tent was unbearably hot even with all the windows fully opened. Turns out those same storms caused damages in the Gatineaus, the Laurentiens and all the way to Quebec City.